An underlying trend of strengthening commodity import demand around the world still appears intact. Although the precise rate of growth is not easily estimated, and there is considerable uncertainty about the future performance of some large components, world seaborne dry bulk trade can be expected to remain in a positive mode. Several major economies decelerated in this year’s early months, potentially an adverse influence for consumption of many dry bulk commodities. However, signs suggest that the slowdown probably was a temporary blip, rather than indicating the start of a prolonged weakening. While awaiting further data, most forecasts continue to point to the global economy continuing to perform strongly through 2018. Steel production in the main raw materials importing countries started this year at a brisk pace. According to World Steel Association figures, China’s crude steel output in the first four months of 2018 was 5% above the volume seen in the same period a year earlier, at 289mt (million tonnes). South Korea and India both achieved 4% growth, to 24mt and 35mt respectively, while the European Union’s total was up by 2% to 58mt. also reflect expectations of extra impetus from steel mills’ growing preference for higher-grade foreign ores, displacing lower-grade domestic supplies. Among other raw materials importers, healthy demand for steel in consuming industries, resulting in more steel production, is evident. A positive view of global coal trade this year is reinforced by indications of a solid trend in coking coal movements. Although this sub-sector comprises only about one-fifth of the total, it may contribute much of the overall increment during 2018. Several fore- casters estimate coking coal trade growing by at least 2–3% and possibly substantially faster. Higher steel production volumes are a generally beneficial influence on coking coal consumption and trade. Two countries are monitored particularly closely, India and China. In India an upwards trend is clear, because rising steel output largely depends upon foreign supplies of superior grade coking coal. China’s imports are much more difficult to predict because domestic mines remain the dominant supplier. import demand forecasts are also mostly provisional. Recent signs have not pointed to any severe crop shortfalls in these countries. Grain output in Europe, North Africa, the Middle East and China is currently expected to be similar to that seen twelve months earlier. Based on that perception, related additional import demand may be limited. Consequently, coupled with estimates for other importers, the latest International Grains Council forecast for global wheat and coarse grains trade in 2018/19 starting next month shows just a modest 2% rise, to 369mt. Global trade in forest products provides many bulk as well as non-bulk cargoes, including logs, sawnwoods, woodchips, pulp and other items. Seaborne movements apparently exceeded 360mt in 2017, one of the largest ‘minor’ bulk segments. Further expansion is envisaged this year as well, assisted by solid trends in construction and manufacturing in numerous countries. 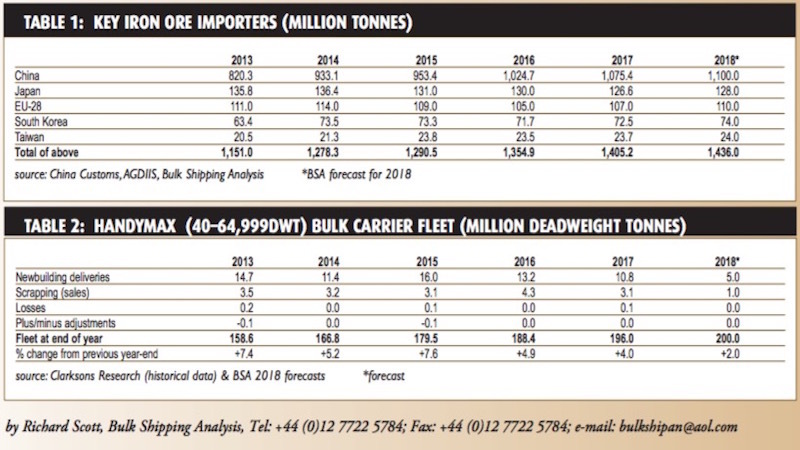 In the Handymax category of 40–65,000dwt-size vessels, comprising almost one- quarter of the world bulk carrier fleet, growth is likely to be noticeably slower during 2018 as a whole. As shown in table 2, much lower newbuilding deliveries are expected and, despite reduced scrapping also, the carrying-capacity expansion rate could be roughly halved.